On 14th October, an airport campaigner from Frankfurt was walking with his dog in the forest near Frankfurt airport, overflown by an arrival flight path. He spotted an object lying near the path, which turned out to be a huge plane landing flap. Summoning colleagues they photographed it thoroughly, and then called the police. The flap was removed by the police and is being investigated by the German Federal Bureau of Aircraft Accidents Investigation (BFU). Frankfurt airport was aware that a flap had been lost a week earlier, and police said they had searched for it unsuccessfully. The airport initially tried to say it was lost by another plane some years back, but the flap was obviously clean and recently fallen. From markings on the flap, it is clear it is from a Korean cargo plane, and an observer at the time of the incident reported seeing something fall from a light blue plane. There had been similar incident, involving a Korean cargo plane, in 2009. As the flap is about 3 – 4 metres long and weighs between 30 – 50kg, it is fortunate it only landed in forest. But it was only 300 metres from the A661 busy road, about 8km from the airport. Patrick Schuffenhauer mit dem Flugzeugteil. A Walker has found a large part of the plane in the city forest. The approximately 50kilograms piece landed just beside the highway. On Tuesday evening, a Walker in the city forest near the Monte Scherbelino hasdiscovered a large part of the aircraft. Photos: Maik Reuß perhaps it is part of the 50–kilogram a flap. The Finder, Patrick Schuffenhauer, in addition to the four–metre–longpiece. Sala suspected that the plane already lost the part of about 80 to 100 kilograms a fewdays ago. “There are people who think they have seen the Fraport when searching.”The airport operator was to achieve more to no opinion. Sala has informed the police.The police confirmed the discovery of the metal part. “We assume that it is the partthat happened last Wednesday from the sky,” a police spokesman said. The police was looking for such part therefore for a week on behalf of the airport operator Fraport, the spokesman said. The exact origin of the heavy metal part willnow be examined by experts of the Federal Bureau of aircraft accidents investigationin Braunschweig. The Hessischer Rundfunk (hr) has tracked down meanwhile an eyewitness, who want to have seen how the part fell off of a plane. “I was just at home to clean up, when Isuddenly saw how a large part of a plane fell down”, he said to hr-online. “I was justwondering: it‘s going down now on the highway or in a residential area?” The plane had been blue, said the 52-year old according to the observer. Location of Frankfurt airport and the A661 which is about 8 km from the runway. Ein Spaziergänger hat im Stadtwald ein großes Flugzeugteil gefunden. Das etwa 50 Kilogramm schwere Stück landete nur knapp neben der Autobahn. Am Dienstagabend hat ein Spaziergänger im Stadtwald unweit des Monte Scherbelino ein großes Flugzeugteil entdeckt. Fotos: Maik Reuß Womöglich handelt es sich bei dem rund 50 Kilogramm schweren Teil um eine Landeklappe. Der Finder, Patrick Schuffenhauer, neben dem vier Meter langen Stück. Schuffenhauer vermutet, dass der Flieger das etwa 80 bis 100 Kilogramm schwere Teil bereits vor einigen Tagen verloren habe. „Es gibt Leute, die meinen, die Fraport beim Suchen gesehen zu haben.“ Der Flughafenbetreiber war zu keiner Stellungnahme mehr zu erreichen. Schuffenhauer hat die Polizei informiert. Die Polizei bestätigte den Fund des Metallteils. “Wir gehen davon aus, dass es sich um das Teil handelt, das vergangenen Mittwoch vom Himmel gefallen ist”, sagte ein Polizei-Sprecher. Die Polizei habe demnach seit einer Woche im Auftrag des Flughafenbetreibers Fraport ein solches Teil gesucht, sagte der Sprecher. Die genaue Herkunft des schweren Metallteils werde nun von Experten der Bundesstelle für Flugunfalluntersuchung in Braunschweig untersucht. Der Hessische Rundfunk (hr) hat derweil einen Augenzeugen ausfindig gemacht, der gesehen haben will, wie das Teil von einem Flugzeug abfiel. “Ich war gerade zu Hause am Aufräumen, als ich plötzlich sah, wie ein großes Teil von einem Flieger herunterfiel”, sagte er zu hr-online. “Ich habe mich gleich gefragt: Fällt das jetzt auf die Autobahn oder in ein Wohngebiet?” Das Flugzeug sei blau gewesen, sagte der 52-Jährige laut hr. In a forest near Frankfurt airport an aircraft part about 4 metres long was found. It is probably had been searching for this path under the flight path for a week. The airport was informed on 8th October by the police about an incident, a Fraport spokesman said on Wednesday. A motorist had reported that an aircraft on approach to Frankfurt had lost a part. The police believe that it is the finding is that part. Its exact origin will now be examined by experts from the Federal Bureau of Aircraft Accidents Investigation (BFU) in Braunschweig. Referring to the ongoing investigation, the BFU wanted to comment on Wednesday not closer to the incident. The landing flap has been taken, for inspection, from Frankfurt to Brunswick. 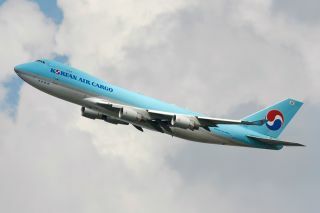 The flap found likely to belong to a Boeing 747-400F of Korean Air Cargo. On August 08 was after the landing of a Boeing 747-400F Korean Air Cargo in Frankfurt damage in the area of the flaps have been found Korean Air aero.de confirmed on Wednesday. But it is still too early to say for sure whether the part found belong to the aircraft. The affected 747-400F was repaired after the release by the authorities in the Rhine-Main and Frankfurt have now left the airport again. Members of the initiative stop flight noise had informed claims to the police on Tuesday around 20.00 clock on the Fund. The Frankfurt City Forest is located near Highway 661 and under the flight path of the airport. A plane lost part of a flap on landing at Frankfurt airport. A week already an ago in the city forest, the piece about four metres wide and weighing 30 to 50 kilograms crashed without causing any damage, into the forest under the arrival flight path. The affected airline itself reported the incident on October 8th, the Federal Bureau of Aircraft Accidents Investigation (BFU) in Braunschweig said on Wednesday. They would not confirm that the flap came from a Korean cargo plane. Aircraft approaching Frankfurt from the east fly over the city forest, and roads, at a height of just a few hundred metres. An eyewitness had seen something falling from a plane, but the police had searched the forest in vain for the part. Members of the citizens’ initiative to stop aircraft noise finally found it, according to their own statements on Tuesday, evening and reported the find to the police, who investigated and removed the flap. It should now be examined in Brunswick. Two experts of the BFU [the incidents investigators] immediately after reporting the incident to Frankfurt, had examined the affected machine and the spokesman said there was no evidence of lack of maintenance of the aircraft. In six to eight weeks, there will be an interim report with initial results of their investigation. The airport operator Fraport said the information about the incident had not been withheld. The competent BFU had immediately been informed. On Sunday a body (perhaps a stowaway in the landing gear) fell from an aircraft into a suburban street in Sheen, reminding people that the area is on an approach flight path. This was not the first case of a body falling from a plane along the arrival path. The body of a Pakistani stowaway, believed to have fallen from a plane, was found in a car park in Richmond, South West London, in 2001. There are other cases of objects falling from aircraft, many being icefalls. In July this year a block of ice landed on Brentwood Cathedral, causing several hundreds of ££s of damage. In June 2010 a block of ice badly damaged the windscreen of a car in Plymouth. These incidents are rare, and so far nobody on the ground has been injured. There have been a considerable number of cases of items falling from aircraft, onto houses under flight paths. 1. The most recent is a case of a large pair of pliers that appear to have been left in the undercarriage of an easyJet plane (as reported by the Sun newspaper) which fell onto a house in Canvey Island, on its way to land at Southend. Falling from some 7,000 feet the pliers went straight through the tiled roof and the ceiling. Luckily the occupants were not hurt. 2. In March a block of what appears to be frozen aircraft lavatory waste fell onto a static caravan in the Midlands, causing severe damage to the roof of the caravan’s bathroom and its floor, as well as ruining the rest of the bathroom. 3. In February a block of ice did serious damage to the conservatory of a house in Clanfield, Hampshire, shattering glass. Again, fortunately, nobody was in the room when the block fell, as they would possibly have been badly injured by flying glass. Click here to view full story…about these three falls. The latest report for AEF from the CAA lists the following as having fallen from aircraft between 1st January and 30th June 2010. For information about how to report objects that you believe may have fallen from aircraft, see the introduction to our safety section. There was also 1 reported stowaway in the UK or in UK airspace during this period. Posted: Sunday, November 23rd, 2014. Filed in Air Freight News, Blog, General News, Recent News.